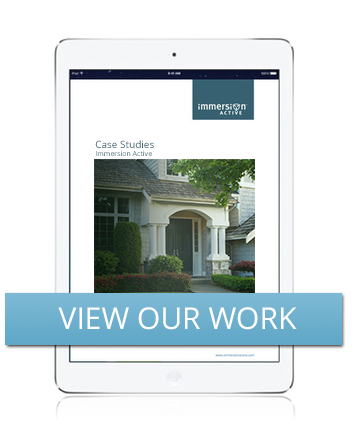 Immersion Active is the leading digital agency focused solely on mature consumers. That’s all we do—market to baby boomers and seniors online. More importantly, we’re the only 50+, digital-only agency with a specialty in the homebuyer market. Whether you’re an active adult, age-restricted, amenity-rich, resort, or multi-generational community selling single-family or manufactured homes, condos, or timeshares, Immersion Active can help drive quality leads in sufficient volume at a steady pace to keep the sales team happy. Our team includes strategists, designers, paid media specialists, copywriters, and social media gurus focused specifically on the 50+ homebuyer. We offer each client a custom solution designed to fit your community’s unique needs. However, our three most requested services include the following: lead generation campaigns; website design; and social media management. Driving leads for your community can be a challenge, especially if you are selling to 50+ homebuyers who may not be ready to buy for 36+ months and you need quality leads with common interests and available funding. Immersion Active’s Lead Generation campaigns drive high lead volumes at lower costs and of superior quality than traditional campaigns. Sales teams love us. Find out why. 75% of senior homebuyers go online to search for homes so it’s vital that your website effectively tell your community’s unique story while still driving leads to your sales team. Over 70% of 50+ consumers use social media channels like Facebook and YouTube to learn about brands and explore options. Yet, mastering the balance between building a community and selling real estate leaves many builders frustrated. Let Immersion Active manage your social media channels so your sales team can focus on selling. Getting to qualified Real Estate leads has become more difficult since 2008 and the old traditional methods don’t work. We had tried to self-manage PPC and were looking for a social media connection that was ‘smart’ and could get ‘smarter’ over time. Immersion Active helped us make that happen. We reply to all inquires within one business day.